Happy 2014 everyone!! I’m sure you are all working hard on those New Year’s Resolutions and are ready to make this year, the year to reach those weight loss goals! Well, I’m right there with ya. So to kick off my first recipe of the new year, I’m sharing a recipe for those who like big, satisfying portions – my Mexican Chicken Spaghetti Squash Bowl Recipe. Spaghetti squash is truly a wonderful and versatile vegetable to work with if you are looking to cut carbs, not portions. By using spaghetti squash noodles in place of pasta or rice, you can create a much healthier dish with less Weight Watchers Points. Recently one day, when on a quest to satisfy my urge for a huge chicken taco bowl, I got the idea to make one using spaghetti squash in place of the rice. I had never used spaghetti squash in anything other than Italian-style recipes, so I wasn’t sure what it would taste like. But the promise of a big, hearty dish of my favorite Mexican flavors for just a handful of Weight Watchers Points made me willing to give it a try. I am so glad I did, because WOW, was it GOOD! Spaghetti squash doesn’t quite taste like rice, so the flavor was slightly different than a traditional Mexican-style rice bowl, but the squash is very mild and mostly takes on the flavor of whatever you are cooking it with, so it was still delicious. In fact, I actually really liked the slight crunch of the squash “noodles”. And the portion size was AWESOME. 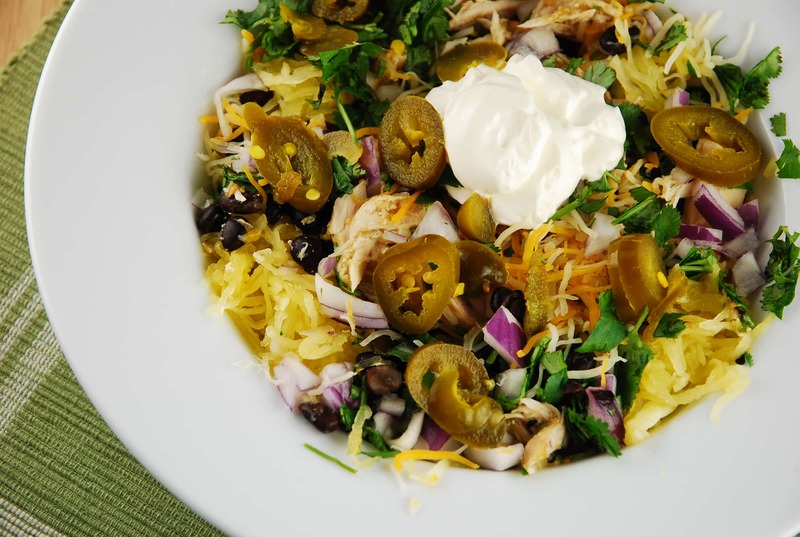 For just 5 Points, this Mexican Chicken Spaghetti Squash Bowl is definitely a winner!! This dish removes the rice in a traditional chicken bowl and replaces it with low carb spaghetti squash noodles. You get a huge, hearty serving that is full of fiber and protein and just a handful of Weight Watchers Points. Place chicken breasts and salsa in a crockpot, and cook on low for about 4-6 hours, or until chicken is cooked through and shreds easily with a fork. Remove chicken from crochet and place in a medium sized bowl. Using two forks shred chicken well. Cut spaghetti squash in half with a sharp knife, and scrape out all the seeds. Place, cut side down in a microwave safe glass dish, with about 1/2” water, and cook in microwave for about 8-10 minutes, or until squash is tender to the touch. Let cool for 10 minutes, then scrape out the noodle-like strands with a fork. Heat olive oil in a large skillet over medium high heat. Add in garlic and cook until garlic just becomes tender and fragrant, about 2 minutes. Add in squash strands, cumin, paprika, chili powder and salt & pepper. Toss for a few minutes, just until squash strands are heated well, and evenly coated with seasonings. Divide squash equally into 6 bowls. Top each bowl evenly with chicken shreds. Now top each bowl evenly with black beans, shredded cheese, chopped onions, cilantro, sour cream, and as many pickled jalapeño slices as you want (if you are using them). TIP: If you are in a pinch, and don’t have the time to cook with your crock pot, you can just chop up some cooked chicken breast (leftover rotisserie chicken works great for this) and top it with some salsa. Your recipes are fabulous! Thank you. Thank you so much for this recipe! I can’t wait to try it! I often make similar vegetarian burrito bowls using roasted butternut squash and quinoa. Yum!!! Omg this dish was so good! My 3rd grader even liked it and he hates when I make spaghetti squash so that was a fear. So easy to make, and great for a next day lunch. This recipe is absolutely fabulous. It’s easy to make and all the flavors blend together in a surprising way. Just the chicken cooked in salas could make a great entree. I am not a food blogger, just an adventorous Weight Watcher. I’m going to go look at all your other spaghetti squash recipes. Thanks from a Texan who knows good Mexican food! The total servings in this recipe are 6. You could cut the ingredients in half, which will give you a total of 3 servings. Then just divide the entire dish by two, and you can calculate it as 1.5 servings per person. Or, you can divide the entire dish by 3, and then serve 2 people and leave 1 serving as a leftover, which would calculate as 1 serving per person (5 Points+). Thanks! It was fantastic, even better the next day!